There’s no doubt that completing the application for an AHCA/NCAL National Quality Award is a big task. After all, the program is one of the leading of its kind! However, you’re bound to run into a tangle or two as you work your way to achieving national recognition—but the Quality Awards team is here to help! As applications come rolling in (Bronze applications due Jan. 31; Silver and Gold on Feb. 28 – apply online here! ), our team is compiling a list of the questions that most frequently land in the quality-award@ahca.org mailbox. Have a question, but don’t see the answer below? Submit it to us! We’ll answer directly, but you can also use this ongoing blog series as a quick reference guide. Q. What kind of educational opportunities will meet the educational requirement? Also, how do I show proof of participation? Participation in a Quality Award educational program is required in order for an application to be considered by Examiners. There are a number of ways you can meet the educational requirement, including programs from state affiliates and multi-facility organizations. Applicants are strongly encouraged to participate in the AHCA/NCAL sponsored webinars as they provide the most accurate information. Q. I am completing my responses to the Organizational Profile section of the Silver criteria. In response to category P.1.a(4), what do you mean by the “desired number” of positions in each department? The intent of the "desired number" component of criteria P.1.a.4 is to identify the your "fully staffed" level. Your current number of employees may be the same as the desired number, meaning that you are fully staffed in that department. Conversely, current number may be below desired number, indicating that you are under staffed. Any insight this ratio gives is strictly for your own benefit, and is not used as a point of evaluation, as the criteria does not ask for current number, only desired number. Q. I have a question about criteria coding for the Silver application. For example, in Category 1, do we answer 1.1, 1.1a and 1.1b? Or do we answer 1.1a and 1.1b? You only need to address 1.1a and 1.1b directly, but your responses to these two should answer the Basic questions posed in 1.1. So, as you response to questions about how your senior leaders guide and sustain your organization and how they communicate with your workforce and encourage high performance, it should become clear how your senior leaders lead. You do not need to supply any proof or documentation of your completion of an educational session. The on-line application form includes a question asking whether you have participated in an educational program. This requirement is in place to help applicants become successful at receiving a Quality Award, so it is in your best interest to complete this requirement. Q. I am applying for the Silver award on behalf of an assisted living center. In responding to criteria 7.1a, I am trying to come up with some clinical data like re-admissions to the hospital in 30 days or diabetes management. However, as an Assisted Living, I also have the option of reporting "non-clinical" data in response to 7.1a. I would like some clarification on how to differentiate the "non-clinical" outcomes requested in 7.1a and the outcomes requested in 7.2. Good question. For an AL facility, the data reported for 7.1can be a process improvement with logical connections to a clinical outcome. For example an increase in satisfaction rates regarding meals may have the impact of reducing unplanned weight loss. While the AL facility may not monitor weight loss, a correlation between satisfaction with food as a deterrent to weight loss in logical and reasonable, and satisfaction rates can be reported under 7.1a. Efforts to improve safety, response time to emergencies, programs designed to maintain/improve strength, balance, cognitive function all have health implications, even if data on health improvements themselves are not monitored. A AL facility may offer an exercise class designed to increase mobility. In the AL setting, data might not be collected showing increases in mobility as a clinical measure, but an AL facility may report an increase in attendance as an outcome measure in 7.1a. The population age 65 and older is expected to more than double between 2012 and 2060, from 43.1 million to 92.0 million. The older population would represent just over 1 in 5 U.S. residents by the end of the period, up from one in seven today. Those 85 and older are projected to more than triple from 5.9 million to 18.2 million, reaching 4.3 percent of the total population. 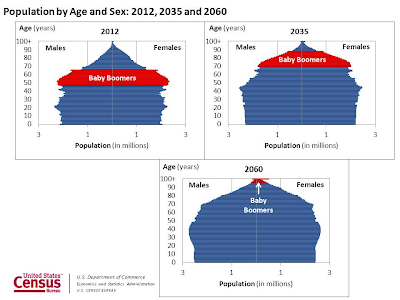 Baby boomers, defined as persons born between 1946 and 1964, number 76.4 million in 2012 and account for about one-quarter of the population. In 2060, when the youngest of them would be 96 years old, they are projected to number around 2.4 million and represent 0.6 percent of the total population. Projections show the older population would continue to be predominately non-Hispanic white, while younger ages are increasingly minority. Of those age 65 and older in 2060, 56.0 percent are expected to be non-Hispanic white, 21.2 percent Hispanic and 12.5 percent non-Hispanic black. For more information on choosing, planning and preparing for long term and post-acute care, check out Care Conversations. 2013 Quality Award Season is Open! Are your New Year's resolutions still going strong? Have you set quality goals for your facility for the coming year? Still looking for ideas? AHCA/NCAL is here to help! The AHCA/NCAL National Quality Award application submission program is now open! This means you can start your year out right by commiting your staff, administration, and center to applying for a National Quality Award! This program is the leading national quality award program for long term and post-acute care centers. In 2012, we celebrated more than 450 facilities that earned a quality award, and we want to help that number grow. If you're interested in applying, you can take comfort in knowing that our staff is here to help. Quality Award program staff are available to answer your questions from 9am to 5pm Monday through Friday, via email at quality-award@ahca.org. For more information, visit the Quality Awards webpage. Stay informed through our Facebook and Twitter accounts! 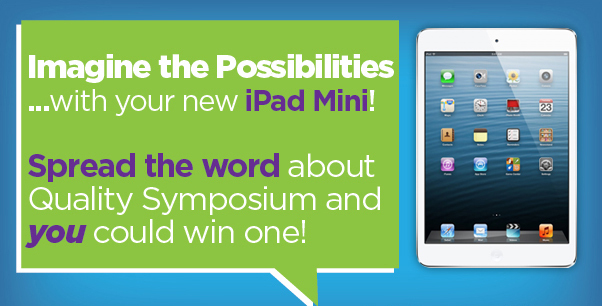 Imagine the Possibilities… With Your New iPad Mini! Hope you all enjoyed the holidays! AHCA/NCAL certainly did. But now we’re back... nose to the grindstone and looking forward to the exciting things coming in 2013. Like the 5th Annual Quality Symposium in San Antonio, TX February 11-13th! Today, we’re excited to announce that not only can you attend this premiere event for professionals looking to improve the quality of care in their facilities. But you can also WIN BIG with an iPad Mini, just by helping us spread the word. We’re keeping the season of giving going with this drawing for Quality Symposium attendees. Just let your friends and colleagues know why you’re going (and why they should go too), and you’re entered to win! There are so many ways to get your name into the pot! Let your friends on Facebook know you’re attending by sharing our pic from our Facebook page. You must be a registered attendee of the Quality Symposium to enter, so go ahead and register if you haven’t yet: qs.ahcancal.org. And HURRY! Deadline to register is Friday, January 11th! Let the sharing begin! Good luck to all!